The life of 20-year-old PF cadre identified as Frederick Mutupa tragically came to an end after the Marcopolo bus he was on with 78 other PF cadres got involved in a road accident Saturday night at 20:30 Hours. The PF cadres were coming from attending the historic launch of the PF national campaigns at Lusaka’s Heroes Stadium. Central Province Commissioner of Police Lombe Kamukoshi confirmed that the road accident happened a Kabowa area, 7 kilometres away from Kapiri Mposhi police station towards Kabwe along Great North Road. The accident involved a Marco polo(PSV) bus registration No. 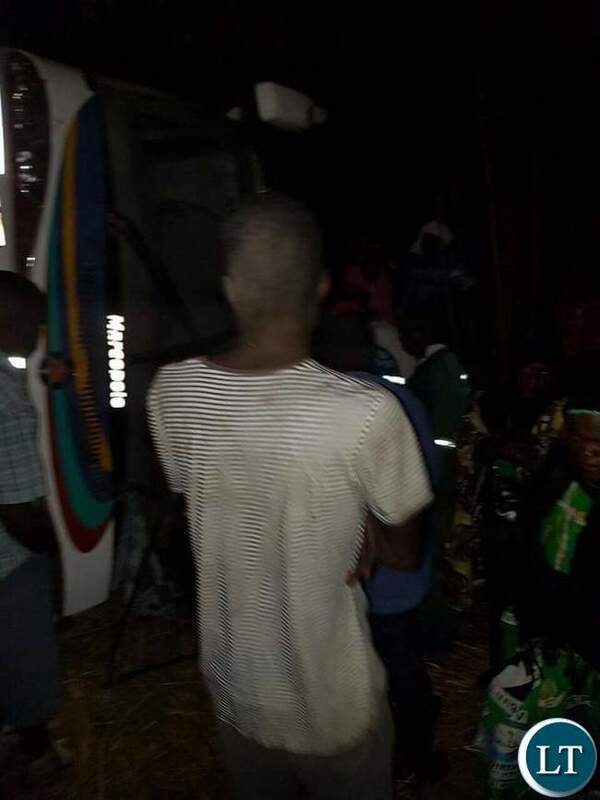 ABH 8577 from Lusaka driven by Simon Mwape aged 46 of Twapya Ndola driving travelling to the Copperbelt with seventy-eight passengers on board who lost control due to excessive speed. The vehicle went to the extreme left side off the road and fell on its left side of the body killing Mutupa aged 20 years who died on the spot due to body injuries. His body in Kapiri hospital mortuary whereas the driver and other passengers sustained various injuries and are admitted to Kapiri Hospital. The truth is coming out, people who filled the stadium came from all 10 provinces and not just from Lusaka. 30 buses came from Copperbelt and about 20 from Western and central provinces. HH managed to fill Freedom Park with only Copperbelt residents, PF will get a shock of their lives on 11/08/16. At least I know that 78 people out of the rest who filled up the stadium were not from Lusaka. i thought all those people at stadium were from residents of Lusaka….,,, anyway too bad, I hope PF will compensate the young man`s family. he died on duty!!! Compensation by PF?? But mulatumfya abantu. Not even Fr.Bwalya will pray for that cadre. Ati record crowd when people were based from corners of the Zambia. My condolence to the dead. HH also admitted the Kite rally had people from other provinces. The two rallies were important occasions that required all party organs to be present. Something thinking. Those people who filled the heroes are Edgar’s supporters regardless of where they came. Besides HH had people from copper belt which is not one town. But all are his supporters and no big deal. Hope RTSA will charge the driver for over loading/speeding…..And suspend the road licence for bus owner…. To all UPND supporters please don’t worry where the crowd at PF rally came from…just worry about August 11 when we retire HH……. What difference does 5,000 cadres ferried from other parts of the country make out of a crowd of 120, 000 attendees? A bus can carry maximum 80 passengers meaning that 5,000 would need 62 buses. Unfortunately there were less than 30 big buses at the stadium meaning the majority of people were from within Lusaka. Love him or hate him, Lungu pulled the largest crowd ever in history of Zambian campaigns. The stadium was full in the stands, some people were seating 3 on a seat of 2 people, the stairs were full, the pitch grounds were full, and out side thousands were just loitering around unable to go in. Sontapo, that is not true. we saw the buses enroute to lusaka with the PF chitenges so do not say those were lusaka residents only. Condolences; we may have different political view points but we are still one Zambia one nation. Let’s work together to stop the carnage on our roads; one life lost is one too many; especially one so young. I was wondering how the number 120,000 was arrived at. Were there some kind of tickets sold or this is the number of legitimate PF names on the register? Otherwise that is arbitrary which is misleading and self comforting. My understanding is that this was a national event requiring the presence of all party organs? So why fret about where the attendees came from? Typical pf abuse of everything, is that heroes stadium not supposed to hold 30,000 to 40,000, even engineers would tell you, liers 120,000 who did the counting? If it was 120,000 people in that pitch wouldn’t be running up and down chasing that motorcade, who is pf to defy all odds of physics. Most of the attendees were bored citizens who went for the entertainment, on voting week the employment and hunger status will dictate on who gets their vote. if they are unemployed, they will vote HH, if they are in employment it’s ECL. Why are some people offended at the fact that the Heroes Stadium was full? Why are some people bitter with the success of that program? Wait people,there is more coming.Before Aug 11,PF will knock themselves out clearly for all to see.PF being made out of dunkards,am certain that this is the only accident that will take place over this wkend.This is just a Kadyonko. Lets wait in 2weeks time people will start coming out for the money they werent paid for attending the PF rally.We will win easy this year,UPND,no pressure.Goal keeper talipo,then Ba coach hasnt paid his players. These rallies will not translate into votes so PF to win will havw to rig the elections at all levels from ballot printing to vote counting and tallying. Even the PF vuvuzela TV said people from the TEN PROVINCES of Zambia filled the stadium. What is there to argue? Of course they will fill the stadium with bribery. Throw some beer, Chibuku and Kachasushi and BINGO! To those considered as the elite throw in some Jameson. Promise a free concert by musicians and entice people with incentives and voila! This is not the way people and you are all being bribed. Here a person lost their life because of PF. Probably this is due to drinking and driving and this falls on the so called lawyer fake president who should have seen this coming when you mix alcohol and driving. No Vision! No Leadership! If he truly had a vision he could have seen this happening. If he was a true leader he would implemented road blocks for police to monitor and stop drivers under the influence. What a president indeed! How many more to die due to carelessness?